The title of Mozart's "Catalogue of all my works from the month February 1784 to the month [ ] 1[ ]" reveals that he expected to live into the 19th century. Precisely why he began this catalogue is unknown. The first three entries are the piano concertos, K. 449, 450, and 451. The entry for K. 450 reads: "the 9th of February. / A keyboard concerto. Accompaniment: 2 violins, viola and basso. -- (2 oboes, 2 horns ad libitum.)" 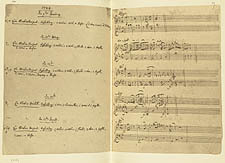 The ad libitum orchestration permitted Mozart to perform his concerto with as few as four instruments or as many as a full classical orchestra, depending on the occasion. When Constanze sold the catalogue to Johann André, their contract stipulated that he would publish an edition of it, which he did in 1805. [top] Mozart's Thematic Catalogue: A Facsimile, ed. Albi Rosenthal and Alan Tyson. Ithaca: Cornell University Press, 1990. [bottom] W. A. Mozart's Thematischer catalog, so wie er solchen vom 9. februar 1784. bis zum 15. november 1791 eigenhändig geschrieben hat, nebst einem erläuternden vorbericht. Neue mit den Original-Manuscript nochmals vergleichene Ausgabe, ed. Johann Anton André. 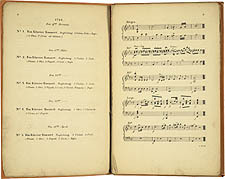 Offenbach: André, 1827.